Ukraine has referred to the International Criminal Court events that occurred on its territory between late November 2013 and late February 2014. 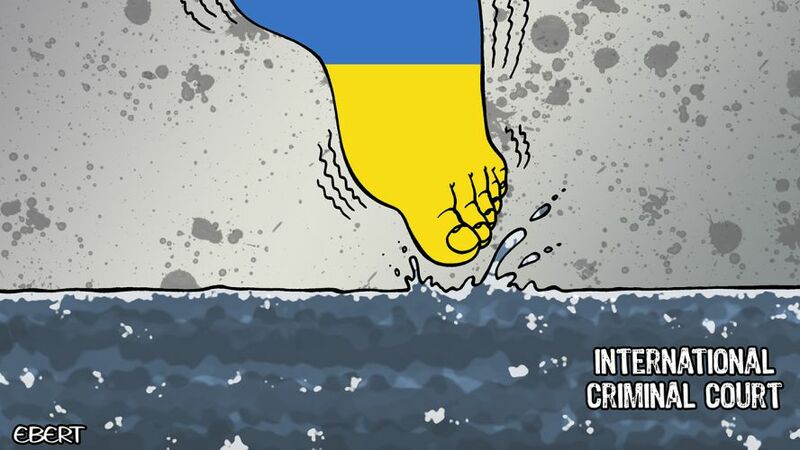 This spring, the Ukrainian parliament passed a resolution asking the ICC to broaden its existing probe to include all alleged war crimes in Crimea and eastern Ukraine. But the government has not submitted any formal declaration accepting the ICC’s jurisdiction over those events. Kirsten Meersschaert is the head of The Hague Office of the Coalition for the International Criminal Court (CICC). Q: Why did Ukraine initially refer the situation to the ICC? There are probably several factors, but what happened in November 2013 was that the former president Yanukovych decided to not sign an association agreement with the European Union that had been in negotiation for many, many years. It was designed to provide a certain level of improved economic and trade relations between the EU and Ukraine. Shortly after the president announced his decision, a number of demonstrations erupted in Ukraine, primarily in Kiev, centred around Maidan Square. These demonstrations were addressed by police and military units in a violent manner and it is alleged that human rights violations took place. A resolution was put forward in the parliament, the Verkhovna Rada, and then the government itself decided to submit an Article 12.3 declaration that these violations amounted to international crimes that could fall under the jurisdiction of the ICC in that they were either war crimes or crimes against humanity. Q: What happens when a state makes a referral like that? A referral under Article 12.3 of the Rome Statute allows States – even those that are not party to the Rome Statute – to accept the jurisdiction of the Court for a limited period of time usually. So the Ukrainian government made a declaration, formally submitted it to the ICC Registrar, saying that they wanted to accept the jurisdiction of the Court over that specific period of time, from 21 November 2013 to 22 February 2014. That does not require the Office of the Prosecutor (OtP) to open a preliminary examination or a more formal investigation whatsoever. The prosecutor did do so, but she was not obliged to do so by the Rome Statute. Q: So, she did look at it. What did she decide? The OtP announced quite shortly after receiving the declaration from the Ukrainian authorities that they were conducting a preliminary examination. This is to determine whether the Court has temporal jurisdiction in terms of when the crimes took place; substantive jurisdiction, so whether there were actual crimes that would fall under the jurisdiction of the Court; and territorial jurisdiction, so does the Court actually have jurisdiction over the territory where the crimes actually took place. Another element of this is complimentarity, to make sure that the specific crimes in question are not already being genuinely investigated and prosecuted at the national level. Q: Is there a time limit for the preliminary examination? There’s no time limit in the Rome Statute. Unfortunately, if you look at the time that other preliminary examinations have taken in the past, it can actually be a very long process. You may be aware of the situation, for example, in Colombia, which is one of the longest preliminary examinations ever opened. It’s still open. So, it can take quite some time to determine whether or not the crimes are admissible before the Court, and whether the Court should exercise its jurisdiction. Q: But beyond that first referral, the Ukrainian authorities seem to have been in a bit of a dance with the ICC about whether they are actually planning to sign up to the Rome Statute or not. Is it clear whether they want to sign up to become members in The Hague? Ukraine is in a situation where the constitutional court ruled that the Rome Statute as a treaty is incompatible with the constitution of Ukraine because that constitution only recognises the highest courts of Ukraine as the ultimate judicial authority. So it’s exactly the complementarity principle that I already mentioned that is in conflict with the constitution of Ukraine and that’s a ruling that goes back quite a long time ago, to 2001, in fact. But Ukraine signed the Rome Statute in 2000. Ukraine is actually the only non-state party that also signed and acceded to the agreement on privileges and immunities of the Court – in 2007. Successive governments of Ukraine have made public statements in support of the ICC, in support of international justice and the need for accountability. So, in terms of what we see, whether in terms of statements or actions, we can’t say that Ukraine is not showing a positive view of the Court and international justice. Q: So why haven’t they signed up yet? Well, there is this constitutional court ruling, and a constitutional amendment process in any country is very long. Constitutional reform is a huge undertaking and very technical. It demands many resources from human and financial resources’ perspectives. We’re talking about the necessity of amending one article, but once you open up a constitution to reform, of course, that’s your opportunity to make all the other reforms necessary. It often requires the consent of parliament, and of course, many other stakeholders in the government who are going to be affected by the changes to the constitution. Legislation may also need to be amended as a result. Q: Do you think the political will is there or is there too much on Ukraine’s plate generally? Well, in the past year, there’s been quite a lot on Ukraine’s plate with the demonstrations and the crackdown in Maidan Square. Then you have the situation in Crimea and, of course, the situation in eastern Ukraine and all of the fall-out from those, either in reference to the relationship with Russia, the ongoing discussions within the UN Security Council, the discussions within the European Union about how to address this conflict on the near borders, etc. But I do think that the demonstration of will was made in the submission of the Article 12.3 declaration last year. What we are seeing now is perhaps a bit of a pause. Sometimes movement on these issues ebbs and waves. Earlier this year, the parliament of Ukraine passed another resolution, calling for the extension of the Article 12.3 declaration to go beyond the February date, without setting an end date. So it would conceivably continue up until today and onwards. That resolution passed. Normally the president would have to act on a parliamentary resolution. But any new Article 12.3 declaration would apply to the entire situation in Ukraine and not just to the alleged acts by the Russian authorities or allegedly Russian-backed military forces, but also to Ukrainian forces. Unlike with the Maidan-focused declaration, in which the current government was not in power at that time and pretty unlikely to be investigated, in this case, we are looking at actions that took place under its rule, and they could well be held accountable if they had a role to play in the alleged crimes. Q: What would it mean for the ICC itself if Ukraine either formally made enough changes to join up or extended its referral? Is it a get-out-of Africa card? Well, yes, geographically speaking, absolutely. But, I think the question to ask is if it’s chance to address human rights violations and victims wherever they are. I think that’s what the Rome Statute and the ICC hope to achieve – to create a situation where the injustices that are inflicted upon civilians whether by rebel forces or their own governments are addressed. And if the victims of international crimes are in Ukraine, and Ukraine is not in a position to prosecute these crimes, that’s why the Court was created. So yes, if it gets to the point of a formal investigation being opened by the Office of the Prosecutor, it will certainly be one way of shifting geographically the focus of the Court. But I think, more importantly, it’s putting attention on victims who don’t yet have a voice. Enrico Bertuccioli is an Italian cartoonist who works for Cartoon Movement.